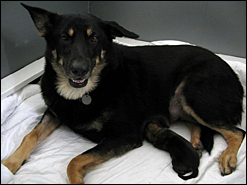 Aspencreek’s Sabaka first came to Dr. Vanderlip for ultrasound imaging for pregnancy. Dr. Vanderlip discovered that Sabaka had only one EXTREMELY LARGE puppy and knew that she would definitely need help. Dr. Vanderlip performed a C-section on Sabaka and delivered a gigantic, healthy, happy Chinook puppy! The sire is Channahon’s Kuska. Congratulations to proud owner, Susan Beals!